BAGHDAD, Iraq (CNN) -- An Iraqi court on Monday sentenced to death a former Iraqi general known as "Chemical Ali" for his role in putting down a uprising in Baghdad a decade ago, Iraqi state TV reported. Ali Hasan al-Majeed, known as "Chemical Ali," appears in court in Baghdad in June 2007. 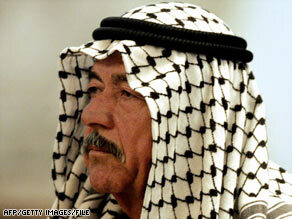 It is the third death sentence for Ali Hasan al-Majeed, a cousin of Saddam Hussein, the former Iraqi dictator. Tariq Aziz, the former deputy prime minister and foreign minister, was acquitted in the same trial Monday along with three other former members of the Saddam Hussein regime. Aziz is awaiting sentencing in a second, unrelated trial next week. Two other officials were sentenced to death by hanging alongside al-Majeed for crimes against humanity. They are Aziz Saleh Hassan al-Noman and Mahmood Faizi Mohammed al-Haza, former senior members of Saddam Hussein's Baath party. Seven others were sentenced to prison terms ranging from six years to life. The trial concerned the suppression of a Shiite rebellion in the heavily Shiite district of Baghdad now called Sadr City. That suppression caused several deaths and injuries. Al-Majeed has been on death row for more than a year. He first was convicted for his role in the 1988 Anfal campaign, where he earned his nickname for using poison gas against Kurds in northern Iraq. Thousands of people died. Two other Hussein-era officials, Sultan Hashem Ahmed and Hussein Rashid Mohammed, also were sentenced to death alongside him in June 2007. Al-Majeed later was convicted of playing a key part in the slaughter of thousands of Shiite Muslims during a revolt in southern Iraq that followed the 1991 Persian Gulf War. Estimates of the Shiite death toll range from 20,000 to 100,000. Al-Majeed and other former members of Hussein's regime remain in U.S. custody. His execution has been delayed for political rather than legal reasons. Sultan Hashem, one of the co-defendants in the Anfal case, is a prominent Sunni leader who is considered a key player in efforts to reconcile the country's once-dominant Sunni community with the Shiite majority that now wields political power. Iraq's Sunni Arab Vice-President Tariq al-Hashimi has refused to sign Sultan Hashem's execution order -- delaying the execution of al-Majeed and Hussein Rashid Mohammed as well. Iraq law requires all three members of the Iraqi presidency council -- the president and two vice-presidents -- to sign execution orders. It does not say what happens if they do not sign.